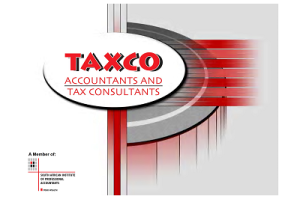 Taxco Accountants and Tax Consultants - is a legally independent professional accounting and tax firm in Bloemfontein, South Africa. Established in 1991, Taxco Accountants is a leading accounting and tax firm with an outstanding reputation and offers an extensive range of professional services with a high degree of specialisation. In addition to traditional accounting and tax, including domestic and international tax planning and preparation, the professional services include training, valuations and business acquisitions, family business services, forensic accounting and litigation support. Taxco has developed several niche areas including joint ventures, partnerships and trusts; money market investments; comprehensive document scanning services; services for the government, public and not-for-profit sectors; accounting and payroll software; business postal services; debt counseling and independent trusteeships. Taxco professionals combine practical knowledge with years of experience to provide a level of understanding and service that is unique among professional service firms. Taxco takes a team approach to every engagement, ensuring the highest degree of technical knowledge, experience and understanding of current issues and regulatory matters. In addition, due to a broad variety of clients, who are treated as business partners, the professionals have added access to a wide range of industry and service specialisation, that provide a variety of professional services including accounting and advisory, scanning technology solutions, recruiting and wealth management. These services are offered in separate business trusts being GR8 Business Trust IT434/01 for accounting and tax related services and whereas Taxco Accountants and Tax Consultants Trust IT 739/97 provide the asset, technology and wealth creation offerings. Each franchise office serve their local business community and is independently owned and operated by the Franchise holder in that area. To recognise that clients are our business partners and our reason for being in business and they are entitled to our best possible products and services, which make good business sense, regardless of variables or conditions. We are committed to training professionally qualified accountants who serve the needs of South Africa, the business community, to set and maintain high ethical standards and to remain relevant in our changing environment. It is the integration of these qualities that defines the Taxco client experience. As one of the leading accounting and professional services firms, we pride ourselves in offering a deep understanding of business and tax practices and translating that knowledge into strategic solutions for our clients. Taxco is driven by a strong code of ethics, and our diversely-skilled team of professionals is committed to delivering the highest level of personal service. Our commitment to the care of our clients and their businesses is strongly reflected in the loyalty they show us - some client relationships we have maintained for over 20 years. We conduct our business strictly within the guidelines of the applicable professional standards set by the above governing or professional bodies, and in terms of other applicable laws and regulations. We acknowledge that these standards, laws, regulations and policies may not govern all types of behaviour and therefore Taxco has further developed it's own internal set of rules, office manuals and policies to improve transparency, trust and consistency of our business processes and dealings with clients. Our management team enables this mid-tier firm with the power and presence to rival the larger accounting firms, but keeping staff focused with the agility to respond to our client’s, needs quickly and decisively. Matriculated at Zwaanswyk High School, Cape Town. Obtained his degree at the University of the Free State. Pierre holds a B.Compt honors degree in Accounting, Auditing, Management Accounting and Taxation. He is a founder member of Taxco after completing his articles at Viljoen, Louw Bartel and Partners, (later known as Coopers Lybrand) and a two and a half year stint at the Receiver of Revenue in Bloemfontein. Pierre lectured on advanced taxation and is responsible for the Taxco policies, standards and procedures. Matriculated at Sand Du Plessis High School, Bloemfontein. Obtained her Internal Auditing diploma at the Central University of South Africa. Amanda joined the firm in 1994, a Professional Accountant (SA)/Adv. Dip Tax (Unisa) completed her SAIPA articles at Taxco Accountants and specialises in Corporate taxation and Internal Auditing. She has a in-depth background in helping companies with their internal controls and changes to their accounting systems. Matriculated at Fichardtpark High School, Bloemfontein. Obtained her Internal Auditing diploma at the Central University of Technology. Also a Professional Accountant (SA), Coreen completed her Diploma in Advanced Taxation at Unisa. Taxco's success is directly related to the talent of it's people. People who add value and serve our clients in the manner which they ultimately deserve. That is why we are so serious about our search for top talent and that strategy ranks the highest of all Taxco's key strategies. At Taxco you'll be working alongside diverse, outstanding people, recognised professional leaders in their area of expertise, who are focused on developing a great business through building the skills and expertise of the team. The simple strategy to hire energetic, innovative individuals, without regard to race, colour or gender who see beyond the obvious, who can think broadly and deeply, is what brings great value to our clients. See also our Workplace Policy on HIV/Aids below. 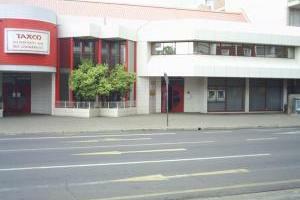 Our head office is situated at Taxco House, 81 Zastron Street, Bloemfontein, Free State, South Africa. Annual closure: Last Friday before Xmas until second Monday in the New year. Gender diversity at Taxco is well supported with the majority of the staff being woman in every department from junior to senior management level. To achieve this high retention of females, Taxco focused on core priority areas that contribute toward the retention of our female talent, these include, flexibility, work-life balance, prejudices, networking, coaching and mentoring. We believe that the attraction, retention, advancement and empowerment of high-performing women, relates to the profitability, sustainability and future growth of our organisation. Being seen as an employer of choice and being a great place to work for, all our people is a key priority for Taxco. To succeed in our business, we are committed to attracting and retaining the best talent, both male and female. Happy, committed and enthusiastic people is our ultimate goal. At Taxco our thinking is not only centred on serving our own interests, but those of the larger community as well. This "corporate responsibility" thinking underlines our focus and determination in reaching long-term goals and sustainability. Each year we volunteer our time to support community programs, we contribute and support non-profit organisations with our professional expertise and in working hand in hand with our clients and business partners we form coalitions that address local needs and strengthen corporate responsibility agendas with the various stakeholders. We do not believe in cheque-book charity and focus on education and assistance. Further as members of different professional institutes and as an accredited training centre, we acknowledge our social responsibility to the community to pass on our expertise to Learners of the accounting profession in a collegial system. To this end SAQA, the NQF, Fasset and SAIPA combine in prescribing Learnerships for potential future Professional Accountants (SA), which we adhere to. Should you require assistance or advice regarding a community project or training, please feel free to contact us at taxco@taxcotrust.co.za. - Save water, electricity and paper. - Make use of recycled materials. - Make our offices energy and water efficient. - Inform our members, associate firms, partners, staff and clients to consider their impact on our environment. Each franchise/member firm is independent. Each is a separate legal, financial and administrative entity, practising under the laws of the country and region where it is based. Each is locally owned, operated and managed, and responsible for its own liabilities. Franchise or member firms are not members of one international or legal partnership. No single firm is responsible for the services or activities of any other, but each franchise /member firm is committed to the standards and values represented by the TAXCO brand. Taxco works in close association with other professionals allowing us to offer a broader range of services and expertise. Correspondent firms perform agreed specialist services on behalf of Franchise /Member firms, but they do not have the same rights or responsibilities and services are rendered on a request basis. They are therefore are not Member firms of Taxco. They are not allowed to use the Taxco name, but they follow practice guidelines designed to monitor their conformity to Taxco and other professional standards when delivering services. Each correspondent firm governs itself and is responsible for its own liabilities. We thank you for taking the time to read our corporate profile and for the interest in our enterprise. We hope that this profile provided you with a better understanding of our business processes and dedication to serve our clients on a flexible, affordable way and with a personal approach without compromising professionalism.